Surveillance is intelligence-gathering by the interception of RF signals or by means of radio interception. Antenna Experts provides solutions for Communication, Navigation and Identification (CNI) antennas searching, detecting and jamming all communications signals. Survival in the digital battlefield is only possible through the use of flexible technology. We provide the fastest and smartest solution to intercept the multitude of signals and information to be successful in the age of information warfare. Antenna Experts assist you in solving complex tasks by providing surveillance antenna, signal intelligence antenna, electronic warfare antenna and RCIED jammer antenna solutions for searching, detecting and jamming all communication signals from HF to UHF. The Armed Forces and intelligence communities face a difficult challenge across the Globe - the need to monitor communications over a very wide frequency range without being detected. Present electronic surveillance systems employ multiple antennas that are either large or noisy. Antenna Experts antenna system provides passive antennas in compact, versatile form factors that provide extreme wideband performance for surveillance purpose. 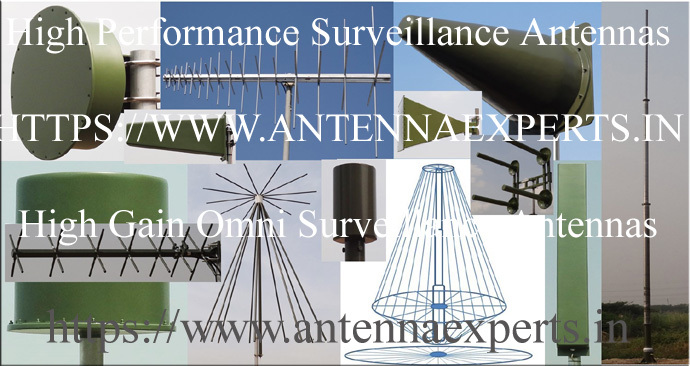 Antenna Experts manufactures Surveillance Antenna for directional coverage like HF log periodic antenna, VHF log periodic antenna, UHF log periodic antenna, dual polarized log periodic antenna, cross polarized log periodic antenna. Antenna Experts also manufactures Surveillance antenna for Omni-directional coverage like HF broadband conical vertical monopole antenna, wide band discone antenna, ultra wide band discone antenna for HF/VHF/UHF bands 2MHz to 600MHz. LPDP Series Dual Cross Polarized Log Periodic Antenna for Directional Coverage for both Vertical & Horizontal Polarized Signals Simultaneously. LP Series Log Periodic Antenna for Directional Coverage for Vertical or Horizontal Polarized Signals. AWD Series Wide Band Discone Antenna for Omni-directional Coverage for Vertical Polarized Waves. HFCM Series High Gain HF Broadband Conical Monopole Antenna for Omni-directional Coverage for Vertical Polarized Waves. Please visit our "Log Periodic Antenna"; “Dual Polarized Log Periodic Antenna”; “Wide Band Discone Antenna” and “HF Broadband Conical Monopole Antenna” sections for more details of their respective antenna products datasheets and installation manuals.